It is early in the morning in East Africa on the 3rd of August. There is no moon in the sky but the stars are brilliant and the air really clear at high altitude of course; so I am walking around the valley without headlamp or light other than just the sky above. Right above us is the spectacular breach wall of Kilimanjaro, that amazing steep face with the glaciers hanging down; that’s iconic for this great mountain. Of course when we first viewed that a couple of days from far down below, and we’ve been walking and climbing closer and closer to the mountain and now we are at the Barranco camp just under 13,000ft. 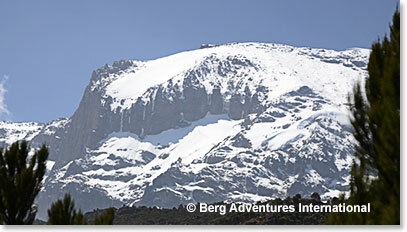 Yesterday was a tough climb for the gang; we are climbing at altitude, the trail was steep but they stuck with it. We kept a steady pace; there were ups and downs as the day goes on. The weather is still good. 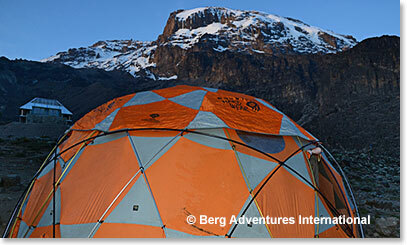 The team arrived here at our camp at 13,000ft at just after four in the afternoon. They were welcomed by the Berg Adventures crew of course, we sat around in our chairs and watched the late afternoon and went to bed pretty early of course. We’ve got a big mountain to climb and now we are going to traverse across to the Karanga camp and tonight we will sleep at the same elevation. 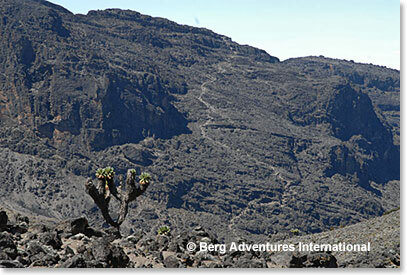 On the way we will cross over that spectacular ledge trail known as the Great Barranco Wall. It should be an interesting morning walk today. The team will be getting up to have coffee in a little bit and we will have a good breakfast the stars are disappearing from the sky and it looks like we are going to have another perfectly clear day on Kilimanjaro. 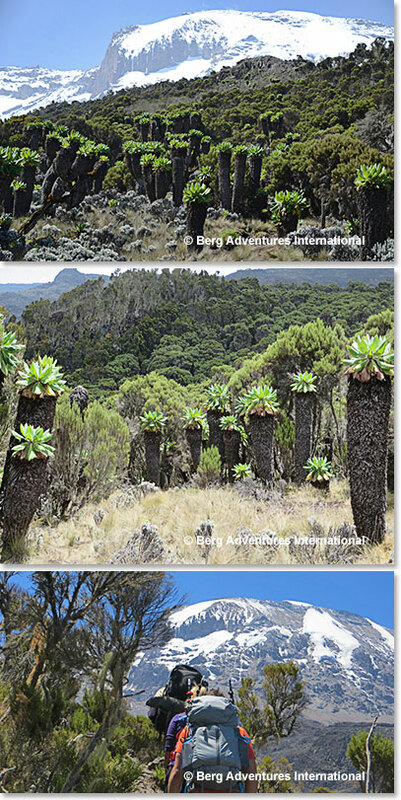 By the afternoon of our second day we had climbed above the forest and reached the moorland life zone of Kilimanjaro, with its beautiful Giant Senecios.